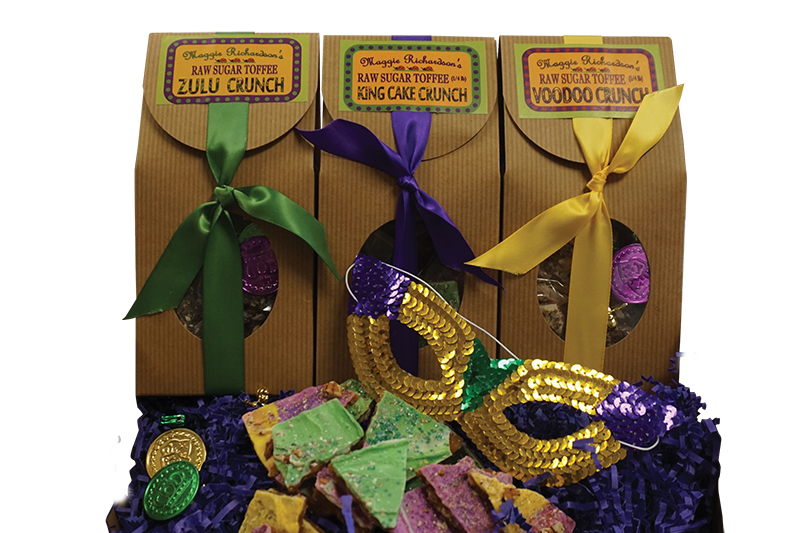 Maggie Richardson’s Raw Sugar Toffee is a Louisiana-owned company whose rich, crunchy product makes an irresistible treat. The unique toffee perfectly blends fresh, raw cane sugar with sweet creamy butter, premium nuts, and decadent chocolates in both signature and seasonal combinations. Since 1922, Tubbs Hardware has served as an old-school hardware store. Today, it’s also a one-stop Cajun souvenir gift shop, famous for its vast selection of Louisiana products including the famous wall of hot sauce and Tubbs Mardi Gras King Cakes. Based in New Orleans, Tchoup Industries designs, cuts, sews, and sells durable, designer bags “for city or swamp.” Owner/Designer Patti Dunn and her team source Louisiana materials such as hand-woven panels, recycled rice bangs, alligator leathers, and nutria furs.